Decide Already! | Hidden Brain Researcher Dan Gilbert says that human beings are the only animals that think about the future. But we don't always do the best job at predicting what will make us happy — or even who we will be. UNIDENTIFIED MAN #1: ...Has a sense of humor. UNIDENTIFIED MAN #2: That can cooperate. UNIDENTIFIED WOMAN #1: That do radio shows. UNIDENTIFIED WOMAN #2: That regularly fashion and use tools. ROBERT SIEGEL, BYLINE: That have chins. VEDANTAM: Psychologist Daniel Gilbert at Harvard University finishes the sentence this way - the human being is the only animal that thinks about the future. DANIEL GILBERT: Every animal learns from trial and error. Human beings learn from experiences they've never even had. They close their eyes and say, would I like liver and onion ice cream? Yuck. Would it be a good idea to put my finger in a pencil sharpener? No. VEDANTAM: But just because we humans have great imaginations, it doesn't mean we do a good job of predicting the future accurately. GILBERT: People just aren't very good at looking into their future and predicting correctly their emotional reactions to the events that might unfold. VEDANTAM: We think a dentist appointment will be awful, and then it's not so bad. We think buying a new car will make us very happy, but it ends up being just nice. We think losing a job is the worst thing that could happen to us, and then it becomes the best thing. The problem is, once our minds get to work imagining the future, we leave out important details, like the nice lady at the front desk in the dentist's office or the free toothbrush. When I think about the future, I also don't consider the fact that I'm going to be a different person in the future - someone who may want a minivan instead of a convertible. Most of us also underestimate how good we are at rationalizing the decisions that we make. Joining me today to talk about our foggy foresight and what we can do to make it better is psychologist Daniel Gilbert. He's the author of the book "Stumbling On Happiness" and one of my favorite researchers in the world. Dan, welcome to Hidden Brain. GILBERT: (Laughter) Well, thank you. You're now my favorite radio host in the world. VEDANTAM: (Laughter) Oh, that was easy. I want to start by asking you a question that you and I talked about a while ago, Dan. Some years ago, you went through a series of very difficult personal experiences, but instead of leaving you broken-hearted, as you might have anticipated, it left you with, actually, a very important insight into your own ability to predict your future emotional states. Can you tell me what happened? GILBERT: Well, you know, my - my personal experiences were no worse than the average person's - in fact, better than most. But, you know, like everybody, I suffer the slings and arrows of outrageous fortune. You know, we have divorces. We have surgeries. We have break-ups with women we love and friends we enjoy. So it was sort of ordinary events that befell me all in one year. And I realized that, had you asked me a year earlier how I would be fairing, the answer would have been, oh, my gosh, I'll be devastated. But I wasn't devastated. It wasn't a good year, but it was OK. And it made me wonder if I was the only person who was just too stupid to be able to look ahead into his future and figure out how he'd feel if really bad or maybe really good things happened. So I went to the laboratory and teamed up with my friend, Tim Wilson, and we started studying this phenomenon. And, you know, reassuringly, we found out we weren't the only stupid people out there. VEDANTAM: You've also found that painful decisions are often painful largely because we haven't made them yet. Once we actually make a decision - pick one of two alternatives - we often end up wondering how we could ever have dreamed of choosing the other choice. GILBERT: Well, surely that's true for all of us. We agonize between two things that seem awfully close. We finally choose one, and in a small or medium amount of time, we look back and wonder how we could ever have been trying to decide between them. Why did we make that mistake of thinking the two alternatives were so close when, in fact, they were really far apart? The answer is they weren't really close, and they weren't really far apart. It's just a matter of how you look at it. And when you're on the front side of a decision, alternatives seem to be very close. But once you've chosen one, the mind gets going doing what the mind does so well - convincing you that the thing you've got is better than the thing you've left behind. Now, if psychologists are trying to cure that, we call it rationalization. If we're trying to sell it, we call it coping. GILBERT: But whether you call it coping or rationalization, it's the same thing. It's the mind finding realistic ways to see the world so that it feels better about the world in which it finds itself. VEDANTAM: You once subscribed to the very popular belief that, I think, I still subscribe to - that more freedom always equals more happiness. And if I remember correctly, you conducted a study once that found that this wasn't quite right. And at the time, I think, you told me that you'd been living with your girlfriend for more than a decade. And you saw the data, and you decided to make some changes in your life. GILBERT: (Laughter). You have a very good memory. So, like many people, I used to believe that the more freedom, the better. How could you be less happy when you had more choice? Well, we know now a lot about why more choice sometimes makes people less happy. In our study, we brought students in, and we created a photography course. And we had all of them work with us for a long time learning how to do black-and-white photography. Then, at the end of the course, we gave them two photographs that they had taken. And we said they could keep one and we were going to keep one. Well, this was horrible for them. They wanted to keep both. They had a tough decision to make. In one group, we said, if you ever change your mind about which photograph you want, just let us know. We'll swap with you. We're going to keep this on file forever, so if took A, and you want B, we'll swap B for A, for as long as we both shall live. Another group was told your decision is final. Once you make this decision, the photograph that you're donating to us gets sent off to England. It'll never be seen again. VEDANTAM: And, of course, if you presented those choices to me, I would say I would want to be in the first group because I would preserve my options. If I took a photograph home and didn't like it, I could come back and trade it in for the one that I did like. GILBERT: Exactly, and that's not even just a good guess. We actually did exactly that in another study. We asked people which group they wanted to be in. And just like you, they overwhelmingly want to be in the first group. But what's interesting is we tracked the happiness of the people who had made these decisions over the course of several weeks. And what we found is that people who made an irrevocable decision - one they couldn't change - were much happier with the choice they made. When you've made an irrevocable decision, you rationalize it. Once something's gone and gone forever, the mind gets to work figuring out why what it got is really better than what it lost. But when a decision isn't irrevocable, when you can remake it and revisit it and change your mind any time, what do you do? You just ruminate about it, right? You buy a sweater and you know you can take it back any time. And every time you put it on, you look in the mirror and you think, oh, I don't know. Maybe it's not a good fit. Maybe it's not a good color. Maybe I ought to bring it back. On the other hand, if this sweater was bought at a place that won't take it back, you look in the mirror and you say, gosh, that looks good. VEDANTAM: (Laughter). So you took this research, and you applied it to your own life? GILBERT: I did. I think my - my then-girlfriend and I had been living together for about a decade. And once we saw the results of this experiment and a friend of mine, Dave Myers, called and said, you know, I think this really explains the difference between living together and getting married, which had never occurred to me. I thought, you know, if you're a scientist and you don't live by your own results, what kind of scientist are you? So yeah, I went home and proposed. And guess what? I was utterly right. I love her so much more now that we're married, now that I can't get out of this relationship no matter how fast I run. She is the love of my life, and I didn't realize that when I was always thinking, should I stay or shouldn't I stay. There's a lot to say about making commitments. VEDANTAM: So let's talk a little bit about why these errors often happen. One idea that you've explored is that when we imagine the future, we often fail to take into account all the little details that will actually make us happy or sad. GILBERT: Well, it's true. Every future event comprises thousands and thousands of details. But when you ask people to imagine a future event, they usually imagine one or two of those details, the ones that are central, that define the episode. So if I say to you, imagine the next visit to the dentist, probably you get a picture in your head instantly of sitting in a chair and someone's fooling around in your mouth. Well, that is indeed a part of the experience you'll have, but you also have to park. You're also going to be in the waiting room. They're going to be playing music. There will be magazines. The receptionist will be nice or not. Afterwards, you will or won't have an appointment you need to rush to. There's lots of other parts of that experience that you're not imagining, and all of them can affect your happiness. Now, you can't imagine every detail. That's not possible. But what you ought to do, rationally, is think to yourself, I'm only imagining one or two of the many pieces of the experience. And as a result, I should be very humble about my prediction, but nobody is. Instead, they say, a dental visit? I'll hate it. VEDANTAM: One of the most interesting things you found in this line of research is that it's not just that we don't imagine the event in the future in all its fullness and detail, but we also don't fully appreciate that we might not quite be the same people we are then that we are now. GILBERT: You know, I think that's even the more powerful of the two errors, so you're quite right. One problem is that we don't imagine events correctly. We don't imagine them as they will unfold. That's the smaller of the two problems. The larger problem is that we don't know who we will be when we are experiencing that event. We underestimate the mind's ability to react to events in a different way than it's reacting to them in prospect. You know, things look different from out the windshield and in the rearview mirror. Life is like that, too. Almost every event you experience feels different once you've experienced it then you imagined it would have beforehand. That's the part of our psychology we don't seem very good at anticipating. VEDANTAM: Do I recall a study that you did recently which tracked people over the course of their lives and asked them how they imagined they would change in the future versus how they had changed in the past? GILBERT: You are remembering correctly. We recently published a paper showing that when people are asked to predict how much they will change in the future, they underestimated. Look, we all know 18-year-olds are crazy. They think they are who they are, they're going to be that way forever. They have crazy hairstyles and tattoos that they believe they're going to want for the rest of their lives. And old people, like me, snicker and go, you're going to see, because 18-year-olds underestimate how different they're going to be when they're 28. And we showed this in our experiment by asking 18-year-olds to tell us how much they would change in the next 10 years and asking 28-year-olds to tell us how much they had changed in the last 10 years. In a perfectly rational world, those numbers would be the same, and they weren't. Eighteen-year-olds thought they would change very little. Twenty-eight-year-olds reported having changed a lot. But what's so interesting about this study is it's also true with 58-year-olds and 68-year-olds. That is, 58-year-olds think, OK, I'm done. I'm cooked. It'll just be me - maybe a little flabbier, more wrinkles, but I'm the guy I'm going to be. Sixty-eight-year-olds look back at the last 10 years and say, wow, have I changed. VEDANTAM: So what's really fascinating about this, Dan, is that no matter how many times we experience these errors in our lives and how many times we make the same mistakes, somehow we don't learn from them, and we're left with the same confidence that we had before that now, this time, when I predict the future, I'm going to be right. GILBERT: There are two kinds of errors. Sometimes you're driving some place, and you take the wrong route. The next time, you always get it right. But then there are errors that are more like, oh, optical illusions. You know, you see those two parallel lines on the page, and you say, gosh, they don't look parallel to me. And then you measure them, and they are. But then you stand back, and they don't look that way. So you measure them again, but they are, but they keep not looking that way. I think the kinds of errors we're talking about are a little bit more like optical illusions. You can't help but see the future in this deficient way. Time and time again, you will find your predictions were wrong, and time and time again, you'll make the same predictions. VEDANTAM: When we come back, I'm going to ask Dan how we can use insights from his research to help us make decisions that are more likely to make us happier in the future. Stay with us. CHRIS BENDEREV, BYLINE: Hi. I'm Chris Benderev, one of the producers of HIDDEN BRAIN. Check out the NPR One app for your phone. It's a great way to find new shows and stories for your end-of-the-summer road trip. Hand-picked podcasts and stories are always ready when you are on NPR One. 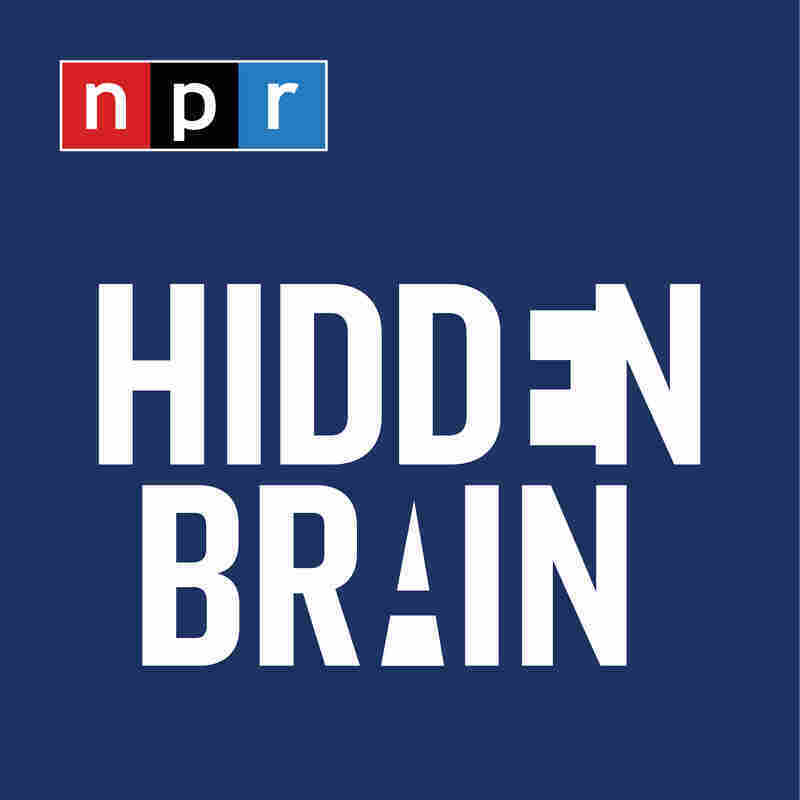 Find it in your app store at NPR O-N-E.
VEDANTAM: This is HIDDEN BRAIN. I'm Shankar Vedantam. I'm talking today with psychologist Dan Gilbert, who studies why we often make choices that are counterproductive to making us happier people. I asked Dan to tell me whether he's found ways to help people use their imaginations to make better decisions for their future selves. GILBERT: We and many others have spent decades trying to figure out, how can we make human imagination better? If when people look into the future, they make mistakes, what kind of training could we give them so they don't make these mistakes? And I will give you the summary of 15 years of research - it doesn't work. GILBERT: Almost nothing anybody has ever tried makes a long-lasting, broad difference. On the other hand, the best way to predict your future, we've discovered, is not to close your eyes and use your imagination. There's a completely different way to figure out how you will feel, and that is to ask people who are already in your future how they feel. Almost anything you're imagining - should I move to Hawaii? Should I become a trumpet player? I wonder if I should subscribe to The New York Times. Would it be better to have a bagel or a bialy? Almost any decision you're debating, large or small, many people have already made it, and they've made it in both directions. There are people who are doing the things you're only imagining. And it turns out that if you can simply measure their happiness, you can get a pretty good guide about how happy you will be in the future. One of the experiments that we did that demonstrated this most simply is we created a speed-dating clinic where young women came in, and they had a speed date with a young man. And they were offered one of two kinds of information. Either they could learn all about the young man before they met him - they could see his photograph, learn his hobbies find out about his likes and his dislikes - or they could learn none of that, and they could get just one piece of information - namely, how much did the woman who already had a speed date with him enjoy it? GILBERT: Well, it turns out, first of all, everybody wants the first kind of information. The women in our study all think they're going to make a much better prediction of how much they'll enjoy the date if they can just learn about the guy. But what we find is that they're much more accurate in predicting their own experience if they know nothing except another woman's experience. This woman is, in a sense, a surrogate for their future selves. And we call this method surrogation - using other people's experience as a guide to your own. VEDANTAM: So there's a commercial application that basically is built on this idea. It's called Yelp. GILBERT: Exactly right. And there are a few domains in which we all know that we want to rely on other people's reviews, if you will - movies and restaurants. Those are the two big domains. Now, why are we willing to rely on other people in these domains? Because we can't imagine for ourselves. I mean, if I say, how much do you think you'll enjoy the new restaurant? You look at me and go, how can I possibly close my eyes and imagine that? When we have no information about a future event, we become surrogaters. We're willing to listen to other people. But if you offer folks even the smallest piece of information about a future event, they will take that over all the Yelp reviews. So let me ask you - you're going to decide whether to spend a lot of money to buy a movie. Would you rather see the trailer or would you rather read reviews? If you're like most people, you would throw out all the reviews by every critic and every Yelper in the world if you could just see the trailer. VEDANTAM: Because you trust your own judgment, in some ways, better than others. GILBERT: You feel if you could just taste 30 seconds, 60 seconds of the movie, you'll know if it's the kind of movie you like, but you won't. Other people's reviews are going to be great information about things like, did the movie go on too long? Did the plot get predictable? Did - you know, did God come out of a machine in the end? All sorts of things you'll never get from a trailer. And yet, if you offer people these two kinds of information - the trailer every time. VEDANTAM: So would you suggest that we should actually have Yelp for everything, that we should be rating our friends and spouses and children and professors all, you know, via this kind of distributed review system? GILBERT: Well, you know, as a professor, I do get rated already, so there is a review system for me. And, you know, at Harvard, we have a quaint tradition. It's called shopping week. And in the first week of school, all the students come in, and they visit classes. They don't choose their classes ahead of time. They visit them all to see 15 or 20 minutes of a lecture because they're convinced and the administration is convinced that they can tell, from 20 minutes of someone's lecture, whether they'll really enjoy and get a lot out of the class. What they're ignoring is a huge database of information from people who actually sat through the class for 15 weeks and have a whole lot to say about whether you'll enjoy it or not. You can't convince a student to take a class that has great reviews if they didn't like the 10 minutes of the first lecture. The problem is something we call the illusion of diversity. We think we are utterly unique, that other people's experiences might tell us a little bit about ours, but not very much, because, after all, we're so different than everybody. Well, nonsense. You're not different than everybody. We're basically all the same. You know, if a Martian knew everything there was to know - everything there was to know about a single human being on Earth, that Martian would know 90 percent of what there is to know about everybody on Earth. VEDANTAM: I have to push back just a little bit because there's also been, I think, voluminous research conducted by maybe colleagues in the psychology department which finds that these reviews are also shot through with all kinds of biases. So female professors, for example, get much worse reviews than male professors when they're just as good. I mean, isn't there a risk in essentially outsourcing your judgment to the crowd when the crowd, actually, is capable fully of having, you know, collective biases? GILBERT: Well, two things to say about this. First, if you share the biases of the reviewers, they will correctly predict how you will feel, even if it's unfair. So let's say you just don't like old guys like me. Let's say there's a bias. Students can't stand to hear a guy in his 50s yammer and yammer. Well, that's not very fair. That's ageist. That's wrong. On the other hand, when the students say I hated, it's a pretty good guide for another 18-year-old who will probably hate it for all the same reasons. The second point I'd make is this - I'm not saying that surrogation is a perfect way to make decisions. You know, Winston Churchill once said, Democracy is the worst form of government, except for the others. Well, surrogation is a terrible way to make predictions about your own future happiness, except for the other way to make predictions. GILBERT: You know, imagination is so utterly flawed that surrogation, even with all of its problems, turns out to be a better method than that. Now, if there's a third way to make them, I'm very open to hearing about it, but we've never discovered it. VEDANTAM: One other idea that you and others have found is that uncertainty can amplify the emotional potency of events - that happy surprises and unhappy surprises make a bigger impact on us than happy things that we know are going to happen and sad things that we know are going to happen. Why is this, and how can we learn from it? GILBERT: Well, there's no doubt that uncertainty can amplify emotions. So if I tell you something bad is about to happen, it's probably not going to be quite as bad as if it happens by surprise. And the same is true of good events. What's interesting - and, you know, everybody - we've known that for - for decades, if not centuries, and that's not a particularly deep observation. What we found really interesting is that, even though this is true - people never want uncertainty - they eschew it. They pay good money not to have it. We did a study in which people watched a movie. And for some of the people in our experiment, we didn't let them watch how the movie ended. We didn't let them see what happened to the main character. Now, if I asked you, which of these two movies would you rather see, 100 percent of the hands go up and say, I'd like to see the end of the movie, please. But what we discovered was people who didn't see the end of the movie liked it more, thought about it for longer, were still engaged in it and still enjoying it, even hours or days later. They didn't see what happened to the last - the main character in the end, and so they kept wondering. Gosh, I wonder if he went to college or he became a football player. What an interesting thing to be thinking about and enjoying. So the point is that a little bit of uncertainty can make you very happy, but we never seem to want it. If flowers showed up on your doorstep tomorrow with no note - it just said secret admirer - I bet you'd pay me a lot to find out who the secret admirer was. But I guarantee you, no matter who it is, it's better off just having a secret admirer than knowing who sent the flowers. VEDANTAM: Do you actually try and actively build mystery into your own life when it comes to positive events? VEDANTAM: Dan, I want to thank you for talking with me today. This has really been fun. GILBERT: Sure. It's been fun for me, too. Thank you. VEDANTAM: This episode of HIDDEN BRAIN was produced by Max Nesterak and edited by Jenny Schmidt. Our staff also includes Maggie Penman, Chris Benderev and Kara McGuirk-Allison. You can follow us on Facebook, Twitter and Instagram and hear my stories on your local public radio station. If you liked this episode, give us a review. It helps others find the show. I'm Shankar Vedantam, and this is NPR. VEDANTAM: Thanks for listening to HIDDEN BRAIN. StoryCorps travels the country, collecting deeply personal stories from everyday people. The StoryCorps podcast showcases these stories. You can find the StoryCorps podcast now on the NPR One app and at npr.org/podcast.